“Caribbean weddings are hotter than ever,” says Rebecca Grinnals, president of the Caribbean Wedding Association. The number of destination weddings by Americans nearly tripled in the last decade, with US Virgin Islands, Jamaica, and the Bahamas accounting for three of the five most popular getaways. The November issue of Conde Nast Traveler lists St. John as the number one Caribbean destination of choice among over 27,000 international readers. Maybe choosing the Caribbean is the way to go. Escaping the stress and expense of a stateside wedding production is why so many couples are eloping to St. John to get married by Anne Marie. The weather is summer year round, the beaches are among the most exquisite in the world. Your honeymoon can be spent snorkeling, scuba diving, sailing, hiking National Park Trails, eating in fabulous restaurants, shopping in unique island boutiques or just sunbathing with a good book on the beach. There is no residency requirement, no blood test, you don’t even have to be a US citizen. Anne Marie will create with you a service personalized for your needs, in a unique enchanting place, for the very reasonable price of $400! Getting married in the Caribbean is a warm, relaxed way to have your wedding. 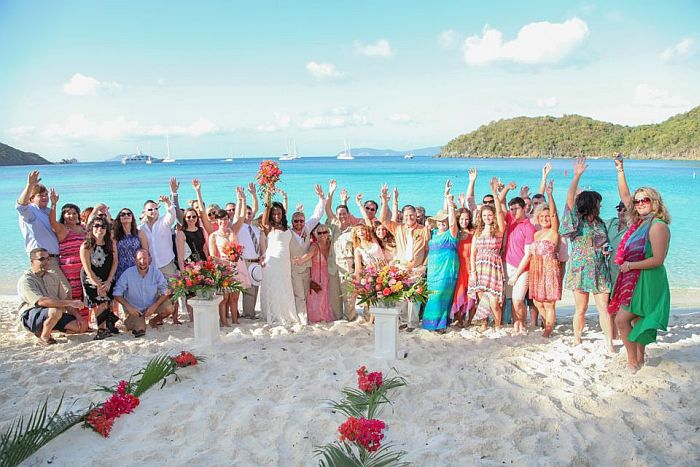 A USVI wedding on St. John can be inexpensive, personalized and memorable. After your island wedding, you can go snorkeling in pristine waters, have a gourmet meal in one of our world-famous restaurants or just stroll hand in hand along a silky sand beach. 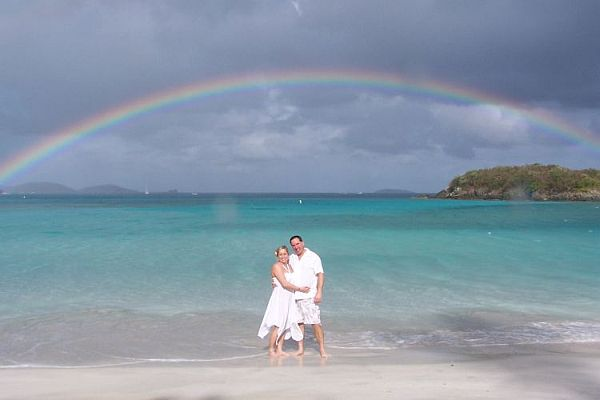 Furthermore getting married on St. John is a joyful way to take the next step in your relationship. 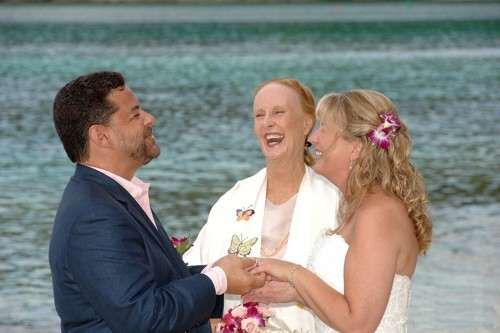 USVI Weddings, with Anne Marie Porter, are determined by your personal preferences and backgrounds. Because her specialty is creating ceremonies that reflect the needs and personalities of the bride and groom. Equally important, Anne Marie will not try to sell you a “package” of things you don’t want or inflate the prices of things you may want (photographer, florist, wedding cake, videographer, musician, caterer, etc.) She will gladly give you the names, websites, and phone numbers of the best people in every category and you can interview them directly and just pay their price. This will save you money and possible disappointment. In conclusion to have a Caribbean Destination Wedding on St. John with Anne Marie is the right thing to do. 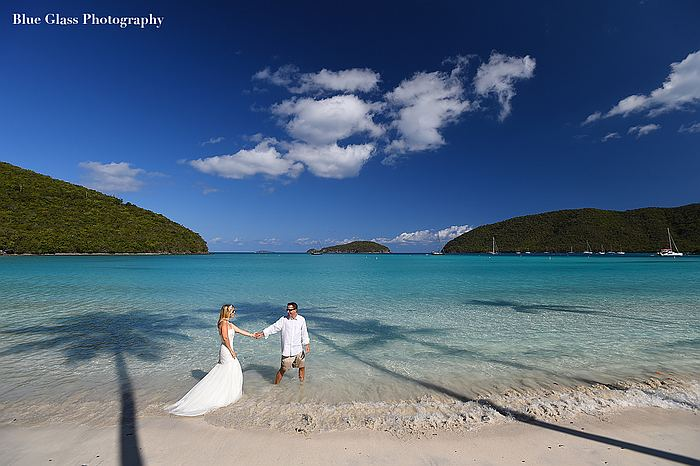 “There are no words to describe how beautiful you made our wedding on Trunk Bay Beach. Your kind and loving spirit was an asset to the beautiful beach we were on. After you left Rod and I had the entire beach to ourselves. We sat on the lifeguard stand and drank champagne and watched the sunset“. We wanted to write to say a short and sweet thank for participating in the biggest event of our lives. We were married on Cinnamon Beach on the morning February 1, 2012. Having since fallen in love with St John and have been back for our first two anniversaries and have plans to be there for our third! Never imagined our wedding day could be so perfect and stress-free and never had a chance to write to you and say thank you. You meet and marry many couples in a year I’m sure so may or may not remember us but I’m attaching a photo that you took of us that morning. You walked us through every step of the wedding process from beginning to end and were better than any bridesmaid! Life is well, we are very much in love and revisit our wedding day often. Thank you and wishing you well. Since we are America’s Paradise, it’s easy to get married here – no residency requirement, no blood test. Download your marriage license application by clicking here and then phone Anne Marie to reserve her for your wedding day. Anne Marie’s hope is for you to have a personalized, reasonably priced, stress-free wedding experience on St. John. 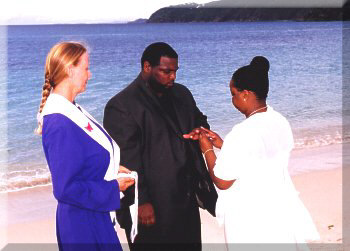 Be among the many satisfied couples who have had their weddings in the US Virgin Islands with “St. John’s barefoot minister”, Anne Marie, a Virgin Island wedding is a unique and perfect way to make your commitment to each other. Your Caribbean wedding on St. John USVI will reflect your needs and preferences and it’s a sweet place to honeymoon. The fee of $400 includes unlimited consultations, and marriage ceremony at the time, place of your choice, and 2 copies of your certificate of marriage. In conclusion, Anne Marie is available 7 days a week, 9 am to 9 pm to help you plan your Caribbean Destination wedding to St John, USVI.